Conditions and levels arenas and tracks. Easy to maneuver in tight corners. Breaks up clumped, packed footing, then smooths the surface. Tines and blade are fully adjustable. Keeps arena's in shape and cuts maintenance time when used regularly. The track and ring conditioner cuts your maintenance time in half while providing you with a consistent footing every time. Adjust the pitch and the angle of the blade while it stays level and floats along the surface of the arena. 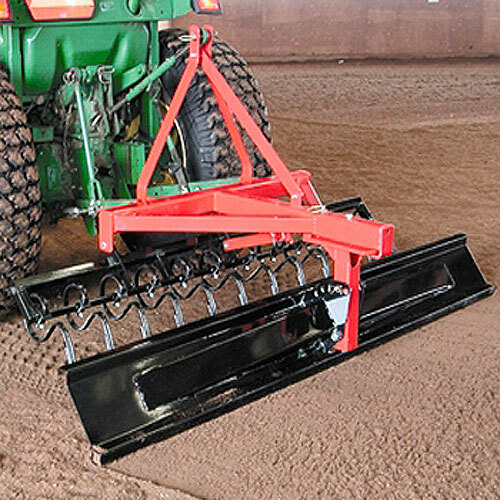 Blade, angle, pitch, s-tines are all adjustable to allow for conditioning arenas based on specific disciples and horse training abilities. Compact lightweight design make them easier to pull than other models. Ramm's track and ring drags are the ultimate way to level, drag and condition your horse arena, dressage court, sliding tracks, hunter/jumper courses and riding arenas. Choose one of our great 3 point hitch drag models that easily attach to any large tractor with a category 1 three-point hitch.